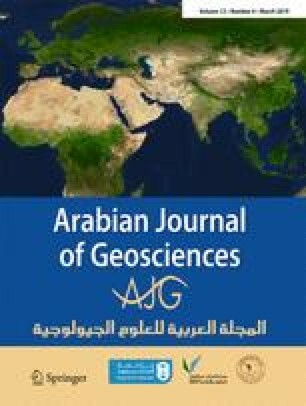 Grain size and mineralogical characteristics of the stream sediments east of Abu Zeneima, southwestern Sinai, were examined using collaborative techniques. Thirty-two samples were collected from four main Wadis, namely, Nasieb, El Seih, Baba, and El Sahu. Wet and dry sieving as well as pipette method were used for grain size analysis. Heavy liquid separation, microscopic investigation, X-ray diffraction, and scanning electron microscope equipped with energy dispersive X-ray spectroscopy were used to examine the mineralogical composition. The clay minerals are present mostly as kaolinite and illite. The heavy minerals are dominated by opaques, pyroxenes, amphiboles, zircon, tourmaline, rutile, epidote, kyanite, sillimanite, monazite, staurolite, barite, xenotime, and apatite. Autunite and goyazite are reported for the first time in these sediments. Autunite forms encrustation on colloidal iron oxide grains whereas goyazite is found as prismatic grains. The two minerals show considerable contents of rare earth elements, mainly Ce, La, Pr, Sm, and Nd. Texturally, the unimodal grain size distribution, the subangular to subrounded grains, and the poorly sorting class signify short transportation distance from one source area. Mineralogically, the low ZTR index indicates a mineralogical immature to sub-mature sediments. The prismatic ultrastable zircon, tourmaline, and rutile and the dominance of unaltered amphibole and pyroxene grains as well as absence of chlorite indicate that the source rocks are mainly the nearby exposed basement units. The presence of uranyl minerals and rare earth bearing phosphate minerals in these sediments reflect a contribution from the Paleozoic sedimentary successions. The authors acknowledge with thanks laboratory facilities offered by Geology Department, Ain Shams University and Nuclear Materials Authority.